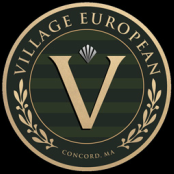 Village European is located 3.5 miles from I-95 (Route 128) off of Route 2 West at Crosby's Corner. HEADING RTE 2 WEST: TAKE EXIT #50. CONTINUE STRAIGHT THRU 1ST LIGHT AT END OF RAMP (ONTO CAMBRIDGE TPK). HEADING RTE 2 EAST: TAKE EXIT #50. TURN LEFT AT 1ST LIGHT AND GO UNDER BRIDGE. TAKE IMMEDIATE RIGHT ONTO ROUTE 2A. TAKE 1ST LEFT AT LIGHT ONTO CAMBRIDGE TURNPIKE.